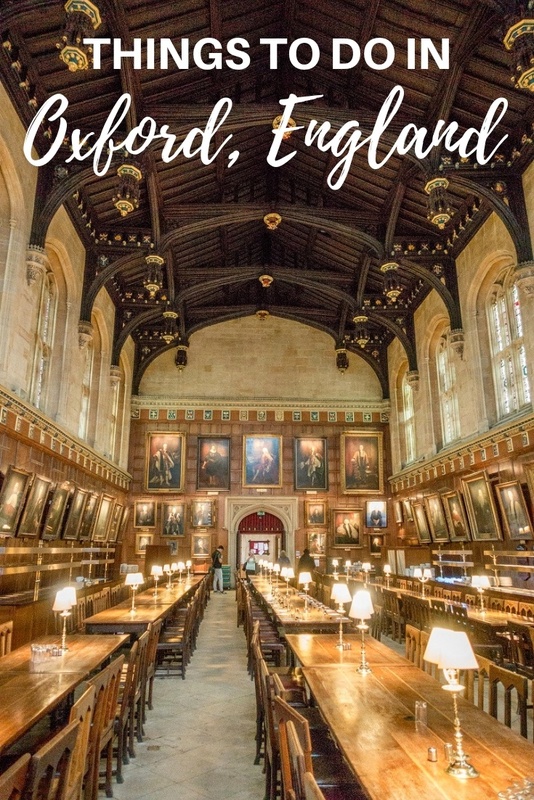 Before smartphones and the proliferation of digital photography, before Facebook and Instagram, even before Harry Potter was a worldwide sensation, for me, there was Oxford. Oxford, England, was my first experience visiting Europe. When I was 17, my mom decided that if I intended to move half-way across the country for college (which I did), I should have a little experience living on my own first. So I moved to Oxford for a month as part of a program for high school students. At the university, I met new people from all over the US and the world, immersed myself in British life for a few weeks, and explored all the things to do in Oxford. Visiting Oxford was the first time I realized how different people’s experiences were from my own, that they ate different food, had a radically different sense of history, and even spoke the same words in the same language but meant completely different things. Oxford was the place that broke my world open. I ate it up and was never the same. It was the place that made me want to become a traveler. It took me 20 years to return to this place. And while my heart felt at home, I was experiencing it new, too. Seeing something at 17 and again at 37 is different for sure. I spent two days both wandering in my old footsteps and doing some things for the first time. It was heaven. Here’s a look at some of the top things to do in Oxford in a weekend. Christ Church is probably the most well-known of the colleges of Oxford University. Not only are its buildings themselves remarkable, but the college has educated philosophers and world leaders for centuries. If you only have time to visit one college, Christ Church is worth it. Christ Church was founded in 1546, and walking through its halls, you feel every bit of that history. I visited here in high school, and the majesty of its Tom Tower, the richness of the stained glass in its cathedral, and the image of its portrait-lined dining hall were some of my most vivid memories. They are just as brilliant now as they were then. After visiting the college’s quads and buildings, you can wander through the Christ Church Memorial Gardens or head a few steps away to Christ Church Meadow, a popular spot for picnicking, walking, and relaxing. 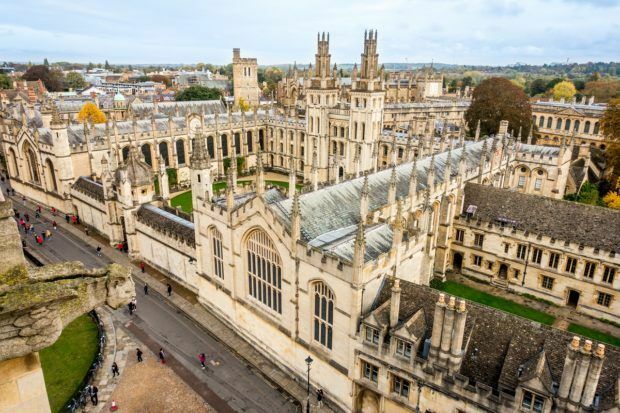 Thanks to the college’s appearance in Harry Potter, Christ Church is one of the top places to visit in Oxford, and it’s much more popular now than it used to be. As a result, you need to book timed tickets in advance, which requires planning ahead. In the fall, my self-guided visit was leisurely. However, when I found myself alone in a normally popular location in the college, one of the guards mentioned that 30 people per minute move through in the summer. For one of the best views in Oxford, head to Radcliffe Square. The sides of the square are formed by magnificent buildings, including the medieval University Church of St. Mary the Virgin, the renowned Bodleian Library, and the 15th-century All Souls College. The circular library in the middle of the square, Radcliffe Camera, is a standout among Oxford’s architectural wonders. I’m always a sucker for a skyline. So, while the view on the ground is lovely, heading up the tower at St. Mary’s is one of my favorite Oxford activities. At 127 steps, the climb is fairly tame compared to many other towers in Europe. Along the way, you can pause to see the mechanisms of the 300-year-old clock. 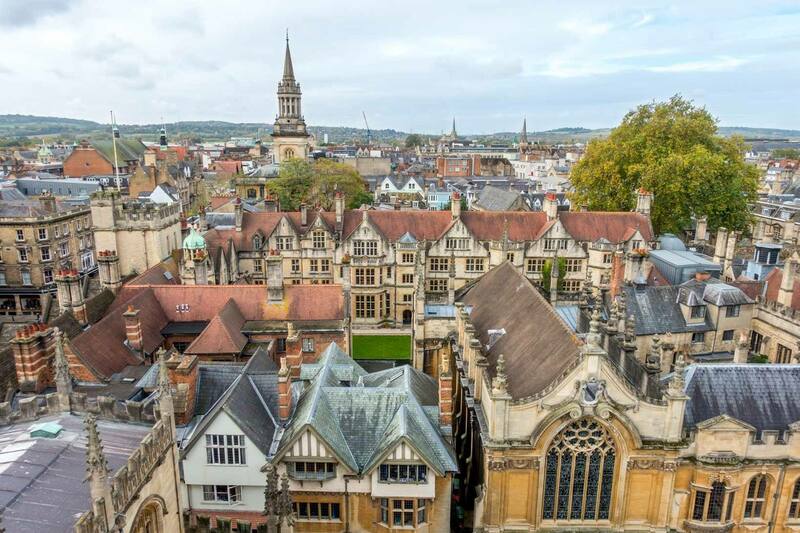 At the top, you’re rewarded with panoramic views of spires, towers, amazing gargoyles, and other Oxford sights. To see inside the Radcliffe Camera, you’ll need to take one of the guided tours that lets you explore the reading rooms and more. Tickets are available two weeks in advance. Also, don’t miss the interior of St. Mary’s, which dates predominantly from the later 15th and early 16th centuries. It is free to visit without the tower. You can’t spend any amount of time in England and not have a proper afternoon tea. One of my favorite places to go in Oxford for tea is the The Grand Café on High Street. The Oxford institution bills itself as the oldest coffee house in England, established around 1650. Options range from simple scones with jam and clotted cream to the “Grand High Tea,” with sandwiches, scones, petit fours, and champagne. Across the street, The Rose has similarly old roots and is also a solid choice. For an even more elegant option, afternoon tea at the Macdonald Randolph Hotel has been an Oxford tradition for decades. The oldest public museum in England, the Ashmolean, was founded in 1683 to house a massive collection of antiquities from the spheres of art and archaeology. The collection spans everything from ancient Egypt to modern China with such impressive artifacts as Guy Fawkes’s lantern, a Stradivarius violin, and Michelangelo’s studies for the Sistine Chapel. One of my favorite sights was the huge deerskin mantle (a cloak) of Native American leader Powhatan—it dates from the early 1600s at the time of the first contact between the native tribes and colonizers. Once you’ve finished visiting the museum’s collections, which are some of the most impressive things to see in Oxford, head upstairs to the rooftop restaurant for a snack, afternoon tea, or even a Sunday roast. You’ll find not only good food but gorgeous views of the city. Admission to the Ashmolean is free, so it’s hard to think of a better place to spend time in Oxford, especially if the weather isn’t cooperating. England’s first board game café, Thirsty Meeples, is the perfect place to visit in Oxford if you’re looking for something different to do. Packed floor-to-ceiling with more than 2,000 games, it’s hard to think of something this place doesn’t have. 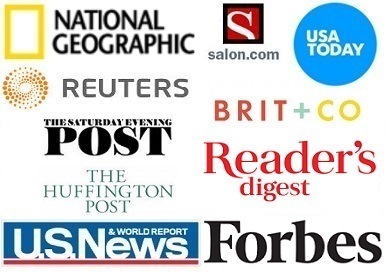 For a modest cover charge, you can spend several hours playing with friends or go on your own to make new friends on their Tuesday night open gaming nights. Order a smoothie, a cocktail, or a sandwich while you plan your next Jenga move or search your memory bank for that illusive Trivial Pursuit answer. Alice in Wonderland is just one of the classic stories dreamed up in Oxford. Written by Charles Dodgson (aka Lewis Carroll), a lecturer at Christ Church, and inspired by the college dean’s 10-year-old daughter Alice, the story has captivated readers for over 150 years. The Alice Shop is the perfect place for lovers of the tale. The shop itself—a small, 15th-century building—was a candy store in the days Dodgson and Alice wandered Oxford’s streets, and it even makes an appearance in the book as the old sheep’s shop. Now, Alice fans can find a wide variety of Wonderland-themed items from umbrellas and plates to postcards, jewelry, and, of course, books. The dodo is a creature that lives in people’s imaginations. It’s used as everything from a cautionary tale of extinction to a cartoonish presence in Alice’s wonderland. It’s been gone for over 350 years, so I never considered that any evidence of it still existed. But it does at Oxford’s Museum of Natural History. The parts of the dodo, which likely died about 1662, are just one of the remarkable specimens at this free museum in Oxford. It’s fitting for a place that also hosted one of the most famous debates about Charles Darwin’s research and his theory of evolution. Although the dodo remains aren’t generally visible to the public, a replica and the bird’s story can be seen alongside the seemingly infinite number of dinosaur skeletons, elephant bones, and taxidermied animals that fill the unique space. Each case and panel has detailed information about the different species, and there are lots of ongoing public events, tours, and workshops to teach adults and children. One thing I found particularly interesting at the museum was the number of panels dedicated to highlighting the research contributions of female scientists, who may or may not have previously gotten the credit they deserved. The Pitt Rivers Museum is a collection of the interesting and unusual from around the world. It was founded in 1884 when General Augustus Pitt Rivers, a noted ethnologist and archaeologist, gave his vast collection to Oxford University. The museum houses more than 500,000 objects, photographs, and documents from nearly every country and throughout every age in human history. The displays are organized by type of artifact rather than the more common organization by geographical region or time period. This means that there are collections of masks, weapons, writing tools, musical instruments, jewelry, and many other objects that show how different cultures solved the same problems over time. 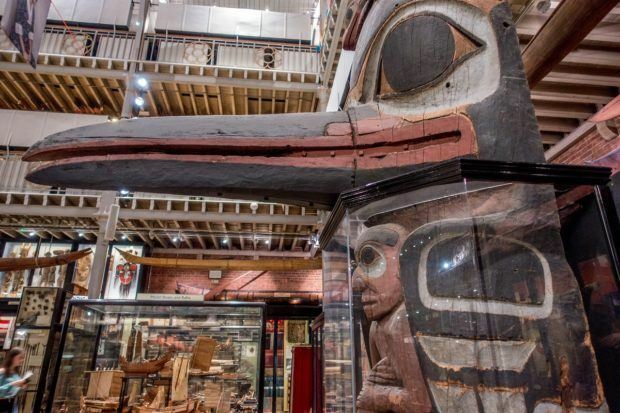 Among the most unique artifacts are the towering totem pole from British Columbia and the museum’s collection of shrunken heads. 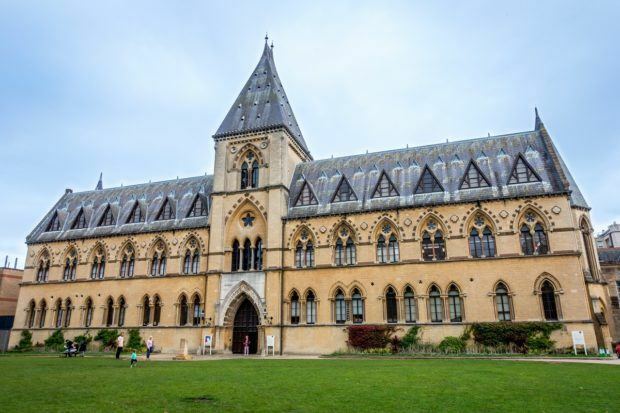 Like the Ashmolean and the Museum of Natural History, seeing the Pitt Rivers Museum is one of the best free things to do in Oxford. It adjoins the Museum of Natural History, so it’s convenient to visit both at the same time. Attending Choral Evensong in Oxford is a perfect opportunity to hear glorious music in glorious buildings. You don’t need to be religious to appreciate the skillful singing and sumptuous interiors of the chapels, many of which date back at least 300 years. Every evening during the school term, many chapel choirs at the Oxford colleges and select parish churches offer Choral Evensong, a service which is almost entirely sung and open to anyone who wishes to attend. The 45-minute service features typical hymns sung by the congregation as well as musical presentations by the choir, which is often comprised of choral scholars, musical professionals, and promising young singers. Evensong is available throughout Oxford at many different locations depending on the day. I opted to attend the Sunday night service at Christ Church Cathedral, which has been home to a choir of some sort since 1526. The music and setting were as beautiful as I had hoped, and attending the service gave me limited access to the college grounds and the cathedral itself. If you’re interested in visiting Christ Church but don’t have time for the tour (or don’t want to pay), attending Evensong will let you see the cathedral and walk through the famous quad for free. Well-hidden among the ancient buildings of Oxford is the Turf Tavern, an historic, 400-year-old pub that still fills with locals and students every night of the week. Thanks to its long history, the pub has welcomed British celebrities from CS Lewis to Tony Blair, and it’s the location where Bill Clinton famously “did not inhale” when he was studying at Oxford. Signs all over the pub tell visitors about interesting events in the establishment’s past. The Turf Tavern is a bit tricky to find down the small St. Helen’s Passage at the end of a winding alley, but once you get there, you find an authentic and traditional pub experience. You can grab a pint at the bar and order fish and chips or opt for a gin and tonic and spicy grilled halloumi under the umbrellas outside. Either way, a visit to the Turf Tavern is a good time. It’s an Oxford must see. I’ve mentioned Christ Church several times because it’s unique among the Oxford colleges and a place I happen to love, but there are 37 other beautiful colleges with outstanding architecture and remarkable history. Many of them are open to the public and easy to visit if you’re aware of their opening hours. Every afternoon, guests can visit the iconic buildings of Exeter College, which has a great view of Radcliffe Square. The alma mater of JRR Tolkein, Exeter still displays a bust of one of its most prominent alumni. New College and its stunning garden are open daily, as is the gorgeous Balliol College, which dates from 1263. The stained glass (and other grand features) are also available for visiting at All Souls College, Magdalen College (pronounced like maudlin), and a myriad of other buildings. Check this list for opening times, and whatever you do, don’t walk on the grass. Fresh produce, unique jewelry, and to-die-for milkshakes are just a few of the things available in the historic Covered Market in Oxford. Opened in 1774, it has been home to traders ever since and is full of unique and vibrant shops and stalls. From snickerdoodle to triple chocolate chunk, don’t miss the offerings at Ben’s Cookies, and make sure to stop by The Cake Shop to see the dramatic fondant creations coming to life. Cutting through Oxford, the River Thames (locally called The Isis) is a central feature of the city. When the weather is good, going punting on the river is one of the best things to do in Oxford. Punting–cruising down the river in a flat-bottomed boat propelled by your own effort and a wooden pole–is best enjoyed when you have several spare hours to learn to do it properly. It can be a bit of a workout, so it’s also a good idea to make sure your route includes a pub. Luckily, one of the boathouses has a pub on-site, so you can still have a pint even if your punting efforts don’t get you as far as you’d like. One alternative to learning punting yourself: hire a chauffeur for a more leisurely afternoon. Every day is a good day for ice cream, and G&Ds is the place to get it in Oxford. There are three stores around the city with the G&D’s Cafe moniker (technically George & Danvers, George & Davis, and George & Delila, if you’re as confused by that as I was). They specialize in natural homemade ice cream and baked goods, and they offer cafe items like bagel pizzas, salads, and other food. My lunch there was good, but the ice cream is really the standout. With flavors like bananarama, t’was mint to be, road to Reeses, and super #?*! chocolate, you’re in for a treat. If you think that Oxford feels a lot like Hogwarts, you’re not wrong. There’s good reason for that—not only do the grand buildings of the wizarding school echo Oxford’s Gothic and Romanesque architecture, but some of the movies’ scenes were filmed with the University as a backdrop. We love Harry Potter and have visited the studios outside London, so scouting out the locations was a no-brainer. 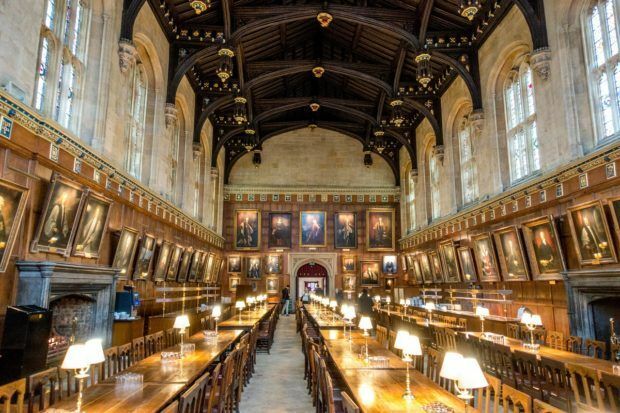 Luckily, it’s easy to put together your own Oxford tour of Harry Potter-related sites. A trip to the Divinity School will find you standing in the bright Hogwarts infirmary, and the cloisters within New College are the same hallways Harry and his friends walked in Harry Potter and the Goblet of Fire. Duke Humphrey’s Library is the setting for the Hogwarts Library in Harry Potter and the Sorcerer’s Stone. At Christ Church, the ornate Bodley Tower staircase will be familiar to fans of the movies, and it’s easy to see how the nearby Great Hall inspired the enchanted Hogwarts dining hall where so much of the movies’ action happens. In a city with as much literary history as Oxford, a place like The Story Museum fits in perfectly. This adorable museum is the fantasy of any kid or adult who loves make-believe or a well-crafted tale. There are opportunities for dress-up, exhibits about authors and their works, and interactive storytelling sessions with games and props. A visit to this unique place is one of the fun things to do in Oxford. The opportunity to activate your imagination is everywhere at the Story Museum—the restroom door has a warning about Moaning Myrtle, the front window has an advertisement for 101 Dalmatians, and there are many other subtle literary references. In the museum’s café and quirky gift shop, there is a range of food, books, and story-inspired items. In 2019, the Story Museum’s exhibits are being revamped, but the café is open and the museum is sponsoring various events throughout the year, including the annual Alice’s Day celebration. The Oxford Artisan Distillery (TOAD) is a grain-to-glass distillery focusing on gins and other spirits. They use a variety of interesting, Oxford-inspired ingredients to develop unique flavor profiles in their products, and everything is sourced from within 50 miles. The Ashmolean gin is inspired by the museum’s collections (and sold there, too), and the Physic gin is made for the University using botanicals sourced from and inspired by the University of Oxford’s Botanic Garden. TOAD’s other spirits have similarly local stories. The distillery offers several different tour options. The standard tour lets visitors see how TOAD’s vodka, gin, absinthe, and whiskey are made from scratch, and the founders’ tour goes even deeper into the distillery’s science and mission. Either option is great if you love craft distilleries like we do. There are so many fun places to visit and things to see in Oxford that you’ll be completely entertained for a weekend. 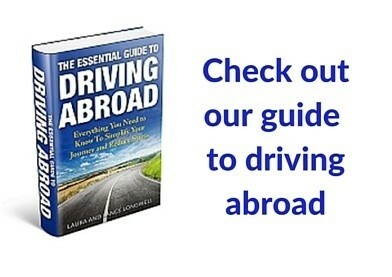 But, with a little more time, consider a day trip somewhere nearby. My favorite destination near Oxford is Bath. The ancient city of Bath has a handful of UNESCO-listed sites, including the ancient Roman Bath complex. 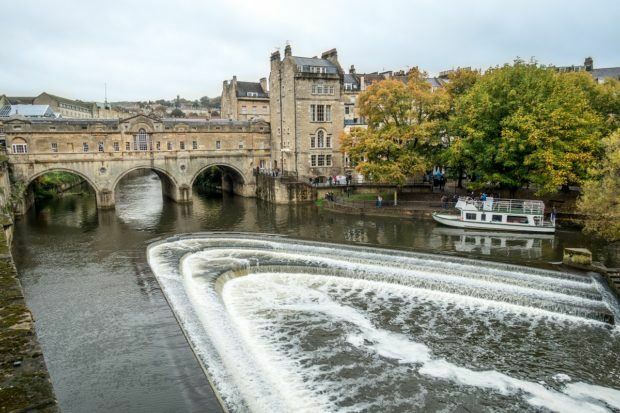 You can relax in the springs at Thermae Bath Spa, visit the shops on Pulteney Bridge, and see the romantic Bath Abbey. Alternatively, head to the opulent Blenheim Palace, the residence of the Dukes of Marlborough and the birthplace and ancestral home of Winston Churchill. If you’re up for an historic adventure, Stonehenge is just a little over an hour away. Oxford is about 60 miles northwest of London. The easiest way to make the trip is by train, and journey takes about an hour. As many as 4 trains per hour leave London’s Paddington Station bound for Oxford with slightly less frequent service from Marylebone Station. Note that Paddington Station is also connected to Heathrow airport via the Heathrow Express, which makes the journey from Heathrow to Oxford straightforward, too, if you’re not staying in central London. From the Oxford train station, the walk to the center of town is 10-15 minutes (less than 1 mile). Getting from London to Oxford by bus takes about 1.5 hours. National Express and the Oxford Bus Company both operate routes. Most Oxford attractions are centrally located and easy to walk to in no more than 15 minutes, if you are staying in the city center. If you need to give your tired feet a break or are venturing further afield, the Oxford Bus Company offers frequent service. I used my Google Maps app on a few occasions and found the timetables and directions it provided for bus routes to be reliable. Having small change for the bus is always a good idea.